Bring new flavor to romaine lettuce with a quick trip to the grill. Yes, the grill. Don't worry, the firm, crunchy leaves of romaine lettuce can take some heat, and a brief bit of time on the grill gives them tempting charred edges and wilts them ever-so-slightly in a wonderful way, adding additional texture to their crunchy nature. You'll find lots of ways to serve grilled romaine at the end of the recipe—from on its own to be the base for yummy salads to being used as a garnish on other dishes. This is a method as much as it is a recipe, so don't worry too much about the amounts. If there are more people coming to dinner, pile more lettuce on the grill! Heat a gas or charcoal grill to high heat (you should be able to hold your hand about an inch over the cooking grate for just a second or two before pulling it away from the heat). Split large heads of romaine in half lengthwise; smaller heads can be left whole. Put them on a platter or baking sheet and brush the head(s) of romaine lettuce with olive oil. Be liberal with the oil—don't drench it, but make sure the lettuce is well coated all over. Sprinkle them all over with salt. Put the romaine on the hot grill. Let them sit and cook just until the edges of the leaves start to char, usually 2 to 3 minutes. Turn them and char on the other side, another 2 to 3 minutes (repeat, if needed, for larger heads that are cut with more "sides"), and remove the romaine from the grill. 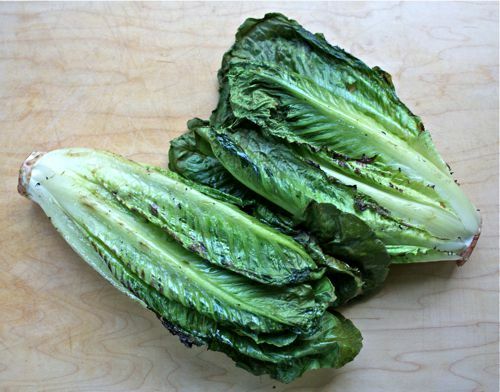 While grilled romaine can be served at room temperature (it isn't really "hot" off the grill, since it's just getting charred, not fully cooked and wilted), making it too far ahead of time doesn't offer many advantages and I can't recommend it. Serve whole small heads or larger heads cut lengthwise as-is, drizzled with a bit more olive oil, lemon juice and a sprinkle of salt, as well as freshly ground black pepper and/or some gratings of Parmesan, Manchego, or other hard cheese. Chop the grilled romaine lettuce into bite-size pieces and toss with your favorite salad dressing —I'm a fan of this Avocado Lime Dressing with it, or this Buttermilk Dill Dressing. Make this Grilled Romaine Salad. Use it sliced in these Turkey Tacos. Create a Cobb Salad with it! Offer alongside spicy dishes such as Posole or Pork Green Chili.